HomeFeaturedWill Trump Keep His Campaign Promises? As soon as he steps into the White House on Jan. 20, President-elect Donald Trump should make the following his top priorities: funding shovel-ready jobs for unemployed Americans, fixing crumbling roads and bridges, bringing industry back to the U.S., ending unnecessary foreign wars, and reducing the size of the federal government. Perhaps no other major political candidate in modern American history has generated as much controversy and media coverage as Donald Trump, the now president-elect of the United States. On Nov. 8, Trump secured well over the 270 Electoral College votes required to win the presidency, but failed to win the popular vote—at least according to official government records. 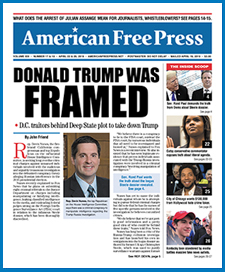 Many of Trump’s key positions and public policy proposals, especially as they relate to immigration and trade policy, have resonated deeply with millions of Americans, including many of the writers, editors, and readers of this newspaper. We at AFP have remained cautiously optimistic about Trump, viewing the populist billionaire celebrity turned politician with both respect and guarded suspicion. Clearly, Trump’s bold stances on fundamental issues such as trade, immigration, political corruption, and political correctness are important, even vital for the future of this country. However, Trump’s blind support for Israel, close connections to the organized Jewish community, and hawkish stance on Iran are concerning. Let us first review what we like about Trump and his proposals, followed by what we are concerned about. In October, the Trump campaign released a 100-day plan that a Trump administration would focus on once it officially took the reins of power. The plan, called “Donald Trump’s Contract with the American Voter,” is published in full at www.donaldjtrump.com/contract. Except for his stance on the Keystone and Dakota pipelines, there is very little with which we could disagree. Throughout the campaign season, Trump regularly lambasted and criticized the political establishment dominating Washington, D.C., and has vowed to tackle the corruption and interest peddling plaguing the federal government head-on. Trump has stated he wants to restore honesty, integrity, and accountability in Washington, and fundamentally transform the way politics are conducted. His 100-day plan proposes to impose term limits on Congress, enact a hiring freeze on federal employees, curtail federal regulations, impose strict limitations on lobbying, and end the “revolving door” of federal officials leaving public service to work for private lobbying firms. These proposals should be commended and enacted immediately to combat the shameless corruption and special interest peddling that have prevailed in our nation’s capital for far too long. Trump’s proposals for restoring the American economy and protecting the American worker should also be commended. Trump has regularly criticized the various “free trade” deals America has signed and enacted over the years, particularly NAFTA, which has devastated the American economy and harmed the American worker. Millions of jobs have been exported while industry has crumbled at home. Trump has admirably pledged to either renegotiate or scrap NAFTA, end the Trans-Pacific Partnership, and proceed with extreme caution on any and all so-called “free trade” deals. For decades now, corporate America has placed the interests of shareholders and profits over those of the American worker, and Trump is finally addressing this issue. Additionally, Trump has vowed to confront China on its currency manipulation and identify and end any and all trade abuses that harm the American economy and worker. He has also pledged to ramp up American energy production and redirect funds away from UN and globalist environmental projects in order to address America’s pressing infrastructure needs. Trump’s “America first” trade policy is long overdue and a major step in the right direction. Arguably Trump’s most important—and controversial—proposals come in the realm of immigration policy. America’s borders were opened with the 1965 Immigration Act without the approval of the American people. This single piece of legislation fundamentally transformed the demographics of this nation, which has led to the displacement of the traditional population of the United States, those of European descent. In recent years, illegal immigrants have flooded this country while the federal government has turned a blind eye. Making matters worse, nongovernmental organizations and state and local governments have facilitated and even encouraged illegal immigration through various measures, including the scandalous “sanctuary cities” policies enacted in some of America’s most iconic and populous cities. Trump has pledged to cut federal funding to all “sanctuary cities” and immediately deport the roughly 2 million illegal immigrants residing in the United States who have committed violent crimes. He has also proposed to temporarily suspend immigration from “terror-prone regions.” It is vital that Trump follow through on these campaign pledges. As the reader can see, Trump’s public policy proposals are dealing directly with some of the most crucial issues facing the future prospects and long-term viability of this nation: immigration, trade, rebuilding our economy, and ending the brazen corruption at the federal level. All of that having been said, this paper has reservations about Trump’s hawkish stance on Iran and his ostensible desire to militarily confront the Islamic Republic—which, it is worth pointing out, has not invaded or attacked any of its neighbors while the United States and its NATO allies are occupying numerous countries in the region. This type of neoconservative rhetoric and policy proposals, which flourished under the Bush administration and, to a lesser extent, the Obama administration, need to be reconsidered. There is speculation that the neoconservative extremist John Bolton, an architect of the Bush administration’s disastrous Zionist-driven foreign policy agenda in the Middle East, is being considered for a position in Trump’s cabinet, which would be a travesty. Trump must reject Bolton and the rest of the neocon Israel-first public policy advisers and D.C. insiders. If Trump truly wants to put America first, any Israel-first neocon hack is a non-starter, and he needs to make that clear. Also of concern is Trump’s blind support for the Jewish state of Israel, his ties to Israeli Prime Minister Benjamin Netanyahu and other Jewish extremists in Israel, and his close connections with many in the organized Jewish community. Many of Trump’s top advisers, including son-in-law Jared Kushner, have close ties to Israel. Given the death grip the Zionist lobby has on the U.S. federal government, this is an issue Trump will have to eventually confront head-on. If Trump truly wants to put America first, appeasing Israel and obeying the commands of the pro-Israel lobby are just not feasible, especially considering that virtually all of the public policies the Israeli lobby strives to achieve run contrary to American national interests. AFP will continue to closely follow president-elect Trump and his transition team. Although we do have concerns and reservations about Trump, his pledges on immigration, trade, and ending political corruption are vital and worth supporting. All of us must do what we can to ensure these policies are enacted and followed through on. FIFTH, he will suspend immigration from terror-prone regions where vetting cannot safely occur. All vetting of people coming into our country will be considered extreme vetting. The Middle Class Tax Relief and Simplification Act is an economic plan designed to grow the economy 4% per year and create at least 25 million new jobs through massive tax reduction and simplification, in combination with trade reform, regulatory relief, and lifting the restrictions on American energy. The largest tax reductions are for the middle class. A middle-class family with two children will get a 35% tax cut. The current number of brackets will be reduced from seven to three, and tax forms will likewise be greatly simplified. The business rate will be lowered from 35% to 15%, and the trillions of dollars of American corporate money overseas can now be brought back at a 10% rate. The End the Offshoring Act establishes tariffs to discourage companies from laying off their workers in order to relocate in other countries and ship their products back to the U.S. tax-free. The American Energy & Infrastructure Act will leverage public-private partnerships and private investments through tax incentives to spur $1 trillion in infrastructure investment over 10 years. It is revenue neutral. The School Choice and Education Opportunity Act redirects education dollars to give parents the right to send their kid to the public, private, charter, magnet, religious, or home school of their choice. It ends common core and brings education supervision to local communities. It expands vocational and technical education, and makes two- and four-year college more affordable. The Repeal and Replace Obamacare Act fully repeals Obamacare and replaces it with health savings accounts, the ability to purchase health insurance across state lines, and lets states manage Medicaid funds. Reforms will also include cutting the red tape at the FDA. There are over 4,000 drugs awaiting approval, and we especially want to speed the approval of life-saving medications. The Affordable Childcare and Eldercare Act allows Americans to deduct childcare and elder care from their taxes, incentivizes employers to provide on-site childcare services and creates tax-free Dependent Care Savings Accounts for both young and elderly dependents with matching contributions for low-income families. The End Illegal Immigration Act fully funds the construction of a wall on the U.S. southern border with the full understanding that Mexico will be reimbursing the United States for the full cost of such wall. It establishes a two-year mandatory minimum federal prison sentence for illegally re-entering the U.S. after a previous deportation and a five-year mandatory minimum for illegally re-entering for those with felony convictions, multiple misdemeanor convictions, or two or more prior deportations. It also reforms visa rules to enhance penalties for overstaying and to ensure open jobs are offered to American workers first. The Restoring Community Safety Act reduces surging crime, drugs, and violence by creating a Task Force On Violent Crime and increasing funding for programs that train and assist local police. It increases resources for federal law enforcement agencies and federal prosecutors to dismantle criminal gangs and put violent offenders behind bars. The Restoring National Security Act rebuilds our military by eliminating the defense sequester and expanding military investment. It provides veterans with the ability to receive public VA treatment or attend the private doctor of their choice. It protects our vital infrastructure from cyber-attack. It establishes new screening procedures for immigration to ensure those who are admitted to our country support our people and our values. The Clean up Corruption in Washington Act enacts new ethics reforms to drain the swamp and reduce the corrupting influence of special interests on our politics. 4 Comments on Will Trump Keep His Campaign Promises? WILL Trump rally the Militia? How many Americans realize we are so far gone? The Deep State has craftily maintained the illusion of freedom (albeit limited by the “need” for security) at home while they perpetrate hegemony abroad. The police state apparatus is just waiting for an opportunity to exert itself. Hopefully Trump can implement his reforms and do even more, but we have to be realistic in our expectations. This is a generational struggle, and who knows how long it will take to reach a critical mass on any of the endless fronts they have opened up in every aspect of our lives. Just list any set of categories and they have exploited every item. Mind body soul, mental spiritual physical financial, economic political legal educational, food air water, transportation, communication, markets, biology, psychology, mass media, religion, environment, zoning development, medical, energy… each of which has a plan and an agenda, with think tanks and federal agencies and black budget ops. Since they mastered resource control, it limits the amount that awakened people can contribute, and even then, we are confronted with false fronts demanding support. I always appreciate and commend John Friend for being a cautious Trump supporter, as opposed to the sort of blind, stubbornly optimistic sort of Trump worshipers who populate the fringes of the alt-right movement. I have taken notice that the blind worship crowd refuses to ever utter or write a single word of criticism of Trump, when we see him making decisions that are clearly horrible ones or when he starts making noises that have ‘flip flop’ screaming out at us. We have to hold this guy’s feet to the fire, and criticize him whenever he deserves to be criticized. Trump’s contract with the American voter can be likened to a pacifier given to a crying baby, it lacks the substance needed to have a truly free Republic. The MSM media are on the warpath, If Trump wants to survive he will have to hire a press team willing to engage in a STREET fight. The MSM is not welcoming the concialotory overtures by Trump… GOYIMS should star using the ALT MEDIA platforms for your ECOMMERCE buying this xmas!!! BUY Trump, Melania. Ivanka products!!! GOYIM your BEST power is $$$POWER.